Destiny Xur update: should you buy The Last Word? Xur is selling one of Destiny’s top hand cannons today: The Last Word. Is it worth grinding the coins for? 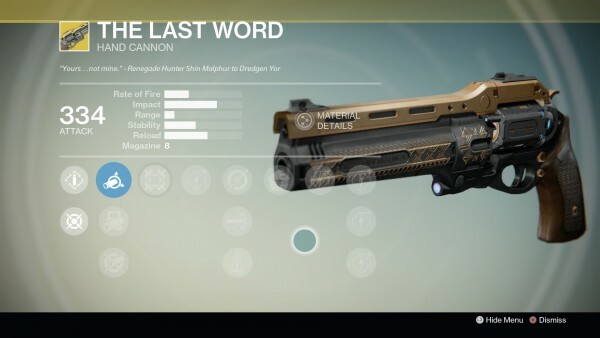 The Last Word is one of Destiny’s best Exotics, and one of the best Hand Cannons in the game. Our Destiny expert Alex notes that it’s one of the most used guns in the Crucible and Iron Banner. “Even unleveled, the Fan Fire perk that allows you to simply hold down the trigger and effectively fire this weapon in full auto is extremely powerful, but when paired with the two main perks, Hip Fire and Last Word, it’ll be dishing out some serious damage,” he says. It’s worth 23 Strange Coins and we strongly recommend buying it. Make sure to also buy the hand cannon telemetry, to make levelling up the weapon faster. This article was originally published April 17, 2015.